It was a piece of land that contemporary artist Hiroshi Sugimoto purchased not far from the remains of the Tenshoan tea house that Hideyoshi ordered Sen no Rikyu to establish when he accompanied him during the historical attack on Odawara, which inspired Sugimoto to launch his magnificent “New Noh” project. 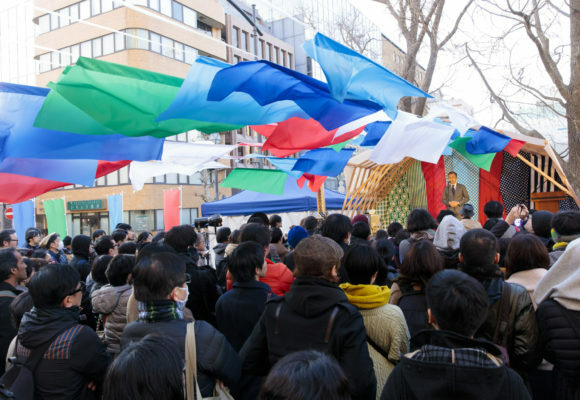 Even though separated by more than 600 years, there is a great affinity between Sugimoto’s work that constantly revolves around themes of “local history and memory,” and the Noh of Zeami, who brought to perfection the revolutionary method of letting ghosts of deceased persons appear as protagonists in a play. As if drawn to the places where they used to live, the ghosts appear on stage for brief moments of wallowing in memories of the old days, before vanishing into thin air again. 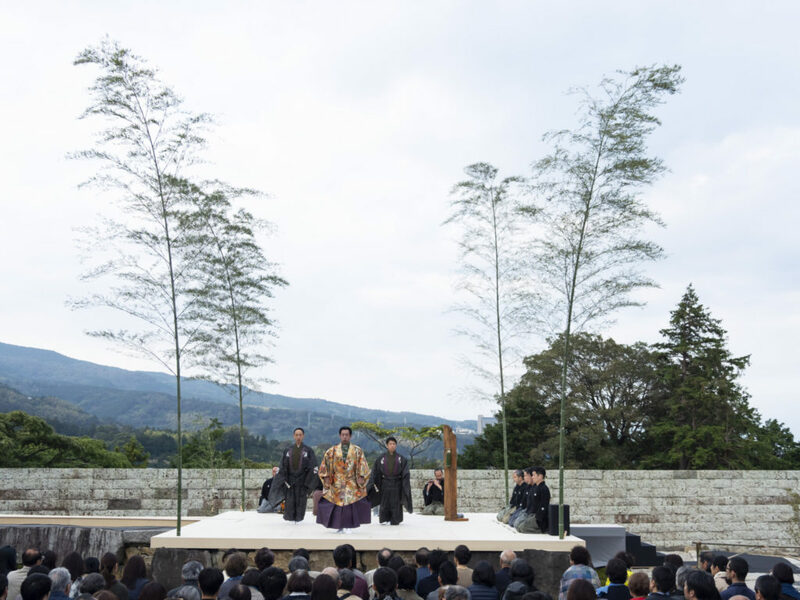 The New Noh production ”Rikyu-Enoura” is set thirty years after Rikyu’s suicide. 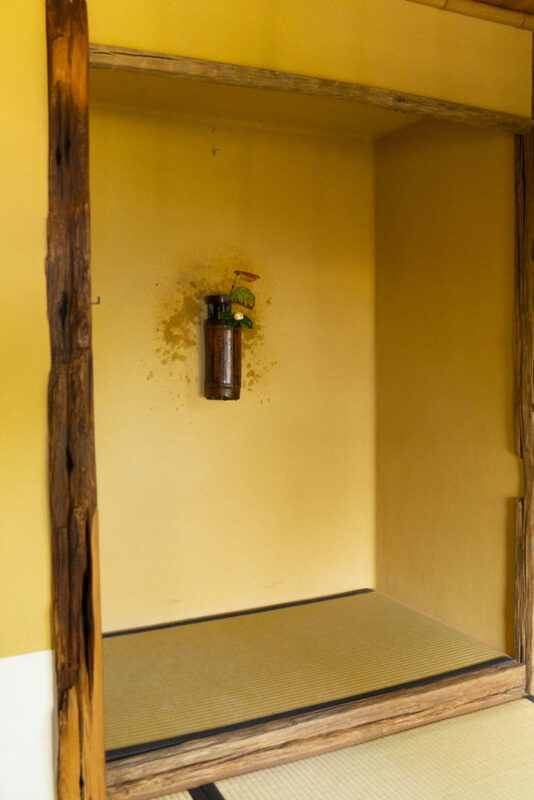 Sugimoto got hold of the “Odahara” bamboo flower vase that is said to be Rikyu’s creation, and used it as a tool for summoning the spirit of Rikyu on the stage, while at once letting Rikyu’s descendant tea master So-oku Sen appear. 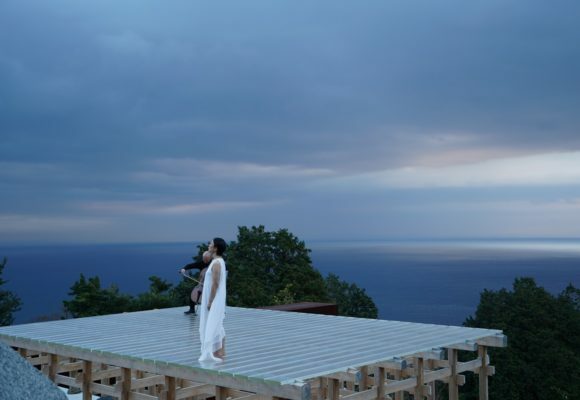 Following a special preview at MOA Museum of Art in February 2017, and the world premiere in New York in November, this fall the piece finally arrived at its destination, the Enoura Observatory’s Stone Stage. Noh is an art form that works on the narrow basis of eliminating superfluous elements until there is nothing left to erase. 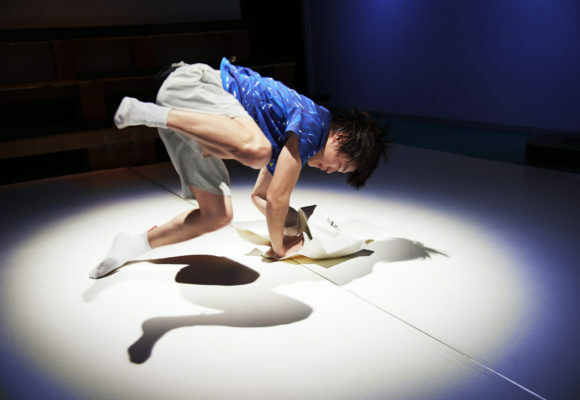 This elimination process is at once the process through which a piece becomes a genuine “Noh” play. 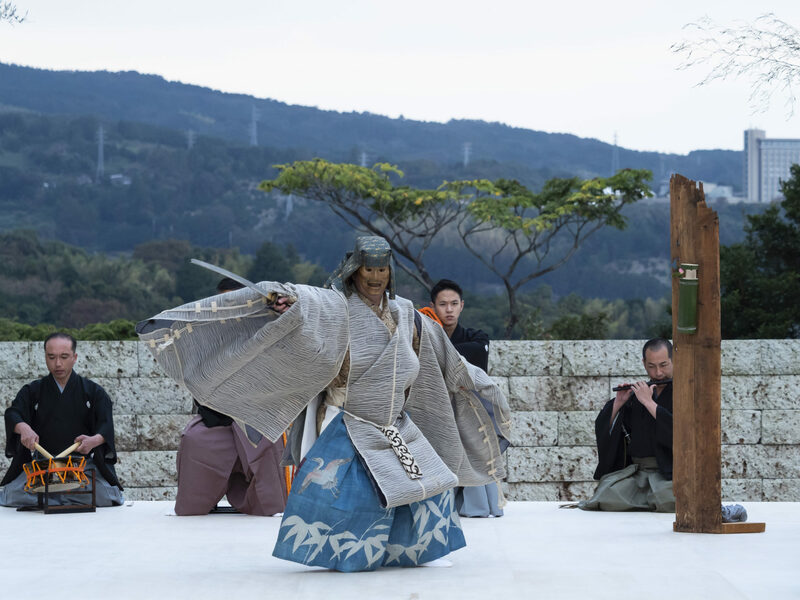 Its creator is supposedly aware of this when he or she makes his work public, whereas the quality that distinguishes the New Noh productions is that they usually make the viewer realize that there is still some fat to get rid of once such pieces are performed on a stage. While I noticed quite a few things that could still be eliminated at the MOA performance, this latest version seemed revisited/revised in most of these aspects. 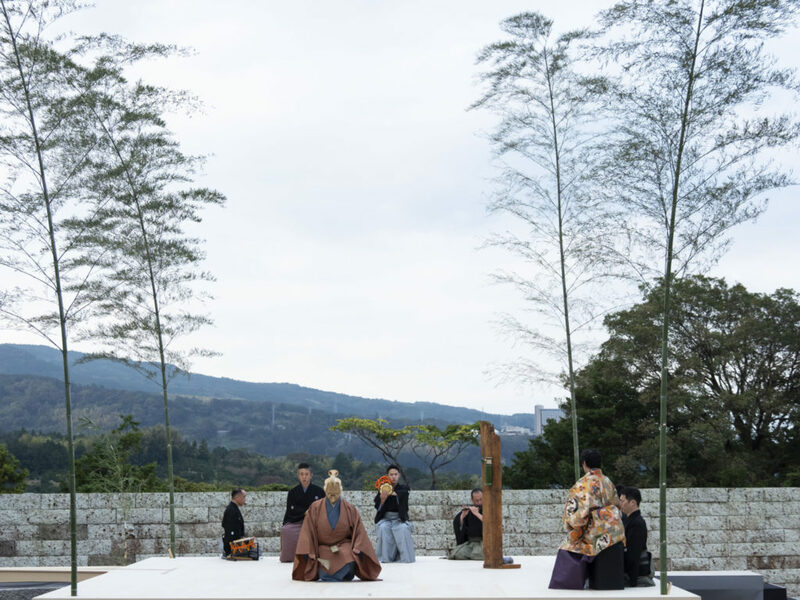 The most significant change was made to the way So-oku Sen’s tea ceremony was presented. In the MOA version, it was an “intermission” connecting the first part at which Rikyu’s ghost appears in the temporary form of an old man, and the second part where the ghost appears in the shape of Rikyu himself when committing suicide. 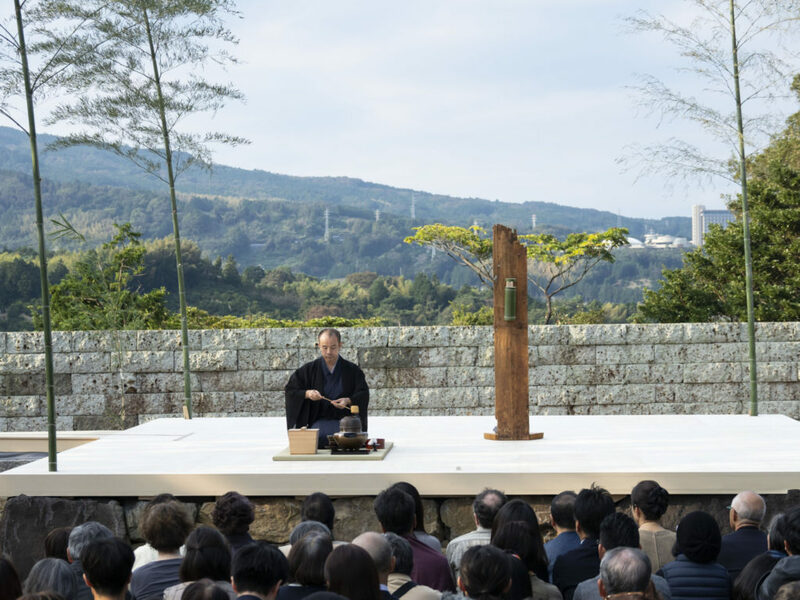 This time, however, the tea ceremony was moved to the beginning, to function as a prologue for the evocation of Riyku’s ghost. In addition, the violent movements that Rikyu’s ghost (in the shape of Rikyu) makes as he wields his sword before committing suicide in the latter part, were largely suppressed this time. This alteration worked well as it allowed the audience to focus on Rikyu’s mental state instead. The drama’s text was significantly shortened as well, and thanks to the actors’ speedy stage entrances and exits, the duration of the performance was cut down from almost two hours to about 80 minutes. But still, the piece is yet to be “completed.” The question is whether it can continuously transform with the help of various people’s hearts and hands that erase one by one every bit of waste and excess that they spot in each performance. Only the New Noh pieces that make this lucky journey will be the “classics of the future.” I’m looking forward to seeing how ”Rikyu-Enoura” turns out once it is completed and becomes a classic in its own right one day.